Do you also have the feeling that this week is going so fast? Without I knew it, Wednesday is over. Scary since I still need to work on the exams. Tomorrow I need to buckle up it seems. I had been busy with catching up with the blog and watching European Soccer Championship. Congratulations to Portugal who just won a ticket to the final. We are hoping that Germany will be their opponent, which will be decided tomorrow after a match between Germany and France. Chanel's Summer Collection is out for some time. I have reviewed the nail polishes previously here. 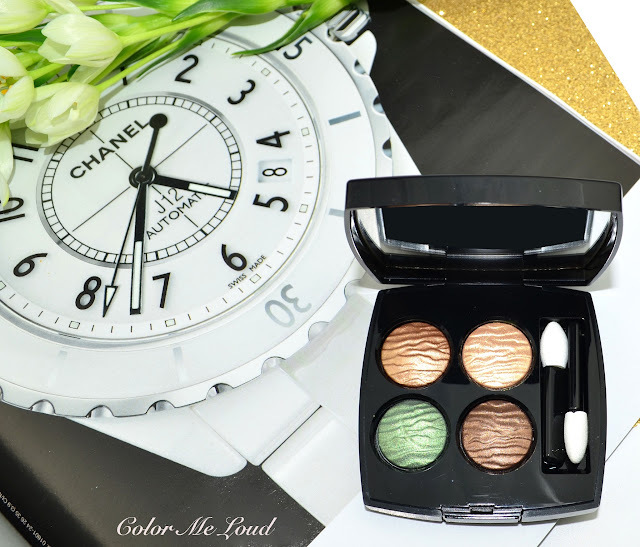 Since then I was enjoying the eye shadow palette from the same collection, called Chanel Empreinte du Désert Quadra Eyeshadow Palette. 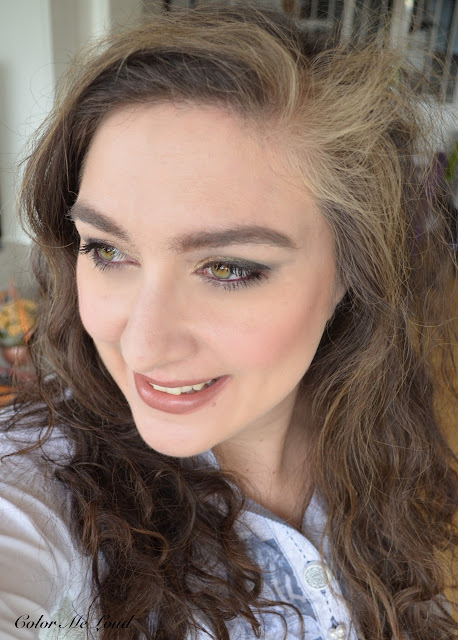 The palettes from their Eye Can Be Collection were rather a disappointment for me, you can see my review of Chanel Les 4 Ombres #272 Tissé Dimensions here. 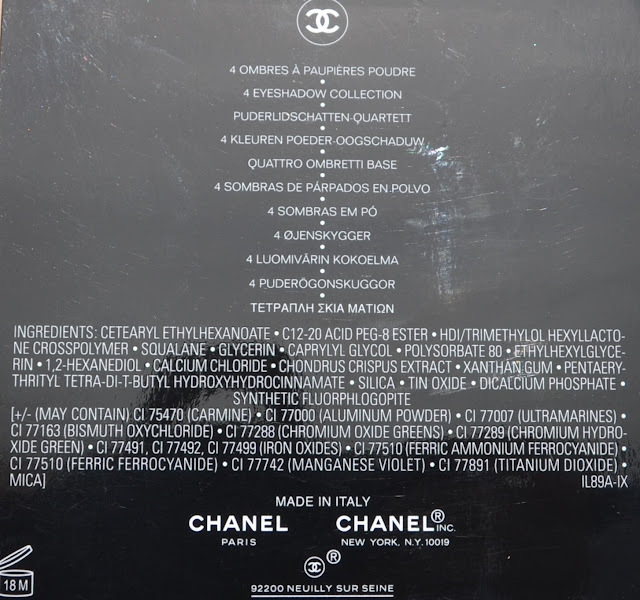 Chanel Empreinte du Désert comes in the signature black Chanel compact. Am I the only one who thinks they should modernize this? I have once asked at Instagram and I know the opinions are divided. I can see this compact being very classical and light weight, hence wonderful for traveling but I think it is a little thick for today's aesthetics. That said I love the embossment of this particular one, it reminds me everything about summer, sand and sea and even sun set. By the way do you know the name of the flowers in this photo? They last for two weeks almost and they look so beautiful, I am a big fan. The quality and the color combination of this quad is nothing less than perfection. Lovely earthy tones which are not too warm and fabulous reflection properties of the shimmery/metallic finishes. It scream luxury and high end, in the best way possible, also when it is worn too. The consistency is buttery, very easy to blend and work with and layers wonderfully. It makes me wonder if Chanel can do this, why did they release the pigment lacking quads for their recent eye collection? This will continue to be a mystery for me. 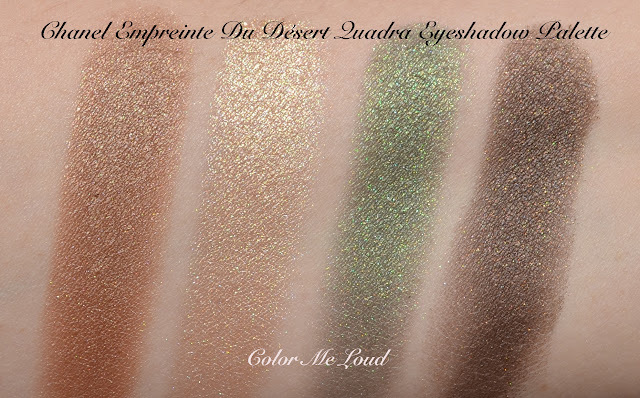 The shades are a medium tan, a light champagne, most wonderful grass green and a golden brown which is not too warm. All in all, perfection but I think I have already said that. The versatility is huge. Almost all the shades can be worn alone or you can go for the neutrals and leave the green away, it can give you a golden eye, an eye makeup with green in the focus is also possible. If you want to go all smoky, the deep brown is perfect and is not too deep. Below I tried to create an eye look with all the shades. Champagne is perfect for the inner corner. If I do a neutral eye, I apply it all the way to the mid-lid but for this eye look I used it only as the inner corner highlight. After that I went for the medium tan shade all over the lid and layered it with some green on top on the outer half. I then added some deep brown on the outer corner and crease. Usually green eye shadow make my eyes look all yellow and emphasizes my olive toned under eye darkness but since the green is very rich and neutral, none of that happened. I can conclude that if you have similar problems and therefore can't wear green eyeshadows much, you might find Empreinte du Désert still attractive. My favorite lippie had to be, Bobbi Brown Luxe Lip Color in Bobbi it is and I am wearing it shamelessly again (just reviewed here). Lately I have been asked to post about the ingredient so I am planning to do it more often. I am glad to see that there is Squalane in there, one of my favorite skin care ingredient at the moment. I have gotten a full bottle of this from Haba in Japan and using it religiously by adding it in my cream at night. Some mentioned that the quads which are made in Italy have better quality but I checked the permanent line, which to me also has (had) great quality and those are produced in France so probably it is hard to tell only by that. Check out the eye looks Linda posted as well, I might need the Stylo Liners to go with that. 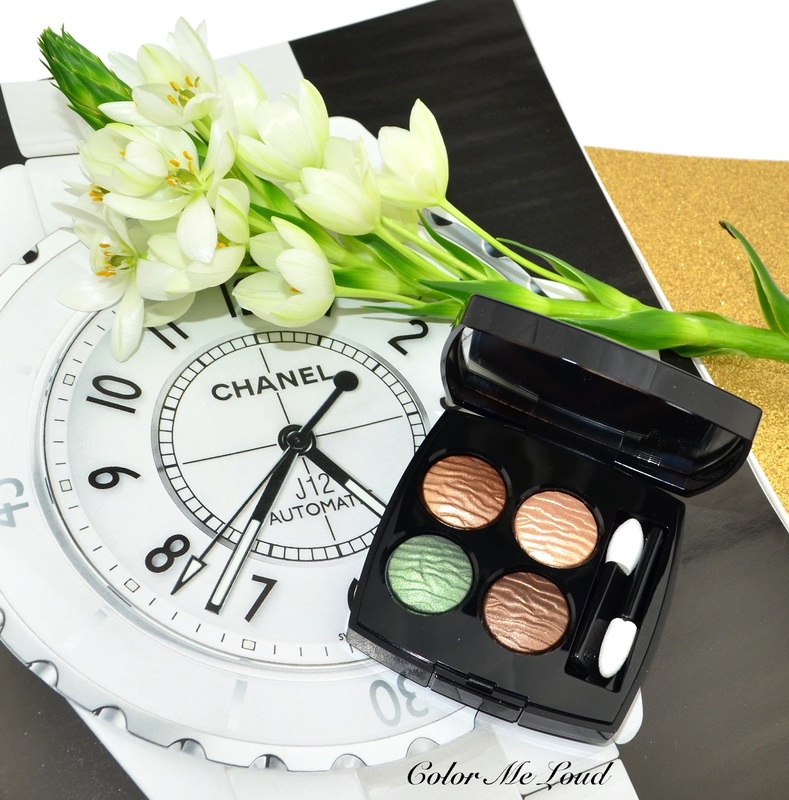 Final thoughts: Chanel Empreinte du Désert Palette is THE palette to get from these year's Summer Collections. It is so versatile with such great quality in terms of its finish, consistency, pigmentation and color combination. Don't miss. What is your favorite green palette? Yay!!! i'm so glad to see this is big love for you as it is for me! Lots to catch up on.... starting now! I am so sad because it looks beautiful on you and Linda, and when I swatched it at the counter the formula is divine, but too warm toned for me-- except for the green but I cannot get a whole quad for the one color. I did get the liner in Oasis. Haven't used it yet but could not resist. 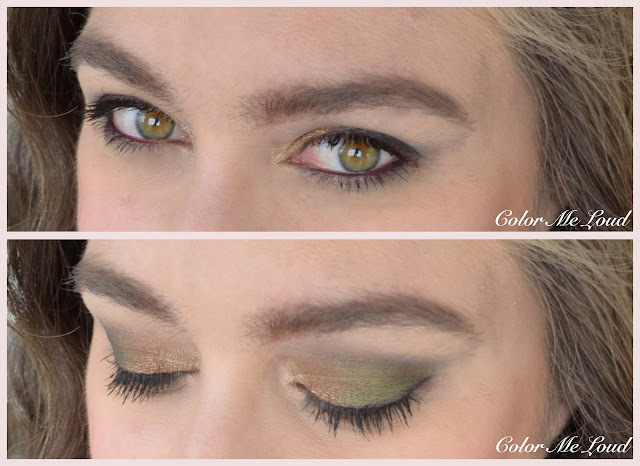 The tones in this palette totally coordinate with your eye color. How pretty! I've been meaning to pick this up, butI keep forgetting! Beautiful palette, but I think it will end up in the drawer or in the “Monica Closet”, I have many similar colors that must be used up. The flowers looks like bouquet-flowering - multi flowering - tulips. And thank you for posting the photo of ingredients. While I had already purchased this, I do generally find it very helpful to know the ingredients before making my decision on whether to buy something or not. I cant agree more, this has great quality and versatility at the same time. It is hard to find something close. Mine already lost the pattern but I am fine with that as long as I wear something many times and it is worth the money I pay as opposed to pretty palettes which I never wear. You are right, I wouldn't get a whole quad for just one shade, at least three shades should be wearable. Hi Lily, I think the shades of this palette would be beautiful on you. Sometimes unavailability is a bless LOL. Still if you need my help let me know. I do the same, depending on my mood I use the green or not. One can go deep or light with those colors too, so versatile and great quality, something which is hard to find all at once usually. Thanks so much for your compliment xox. I think you shouldn't pass on this one, it is really worth the money. As far as I am concerned, they are not tulips but maybe from a close branch of flowers. I love them, they lasted over two weeks. thanks for your comment. I will try to post more ingredients from now on. I know for some it is very important. Sometimes we get samples without a box though so at times it is not possible. I am glad you are enjoying this quad too. I love it! Ps : Big fan of yours since many years, you are truly an inspiration to me. That green really makes the quad for me, so pretty! Where are you Sara? There's a new Suqqu collection out there and we want to see it on you.